Let's start off with what we missed yesterday. I pointed out the warm air to the south, but this is ridiculous. While we were stuck at 47F, Richmond hit 79F! If you read my blog last Friday/Saturday which discussed this warm up just missing us, I truly never expected anything like this. OK- Parents know about those 2's...sorry for the bad pun, but there is so much to talk about today: Ice Storm in the mid west, Sub Tropical Storm near Puerto Rico, and a weekend Winter Storm for us??? The tropics continue to be active as 'Sub Tropical' Storm Olga was named yesterday. This once again brings up the question of naming storms. Recently the National Hurricane Center began the practice of naming 'sub tropical storms'. Not full Hurricanes! Some forecasters believe this is falsely inflating the numbers to justify - well either their off season purpose or the seasonal forecast. Either way, it counts as another one on the list - post season and will be a central Caribbean event this week. Click the image for a full view. The North Atlantic Oscillation (NAO) signal this weekend is going negative, which supports coastal snow storms for us. That is mainly due to the final push of the Midwest ice storm strengthening when it moves out to the ocean on Thursday. 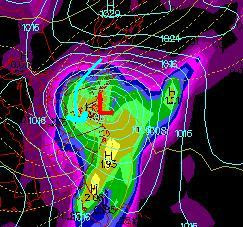 Here is the GFS outlook for Sunday showing a large coastal storm off of the DE coast. Both the Canadian and GFS support this, but plotting an ice/snow line this early would be purely guesswork. At this time, I would hedge my bets on a mix developing late Saturday, turning to snow on Sunday. For reference, since the GFS did the best job with this storm, I will continue to show this model's projections for Sunday morning. Remember that timing and position can vary widely over the next few days, so it's a little early to get really excited.